Mail « It's For My RP Spec! Etana Newbury is a strong, independent woman of the Warcraft Universe. 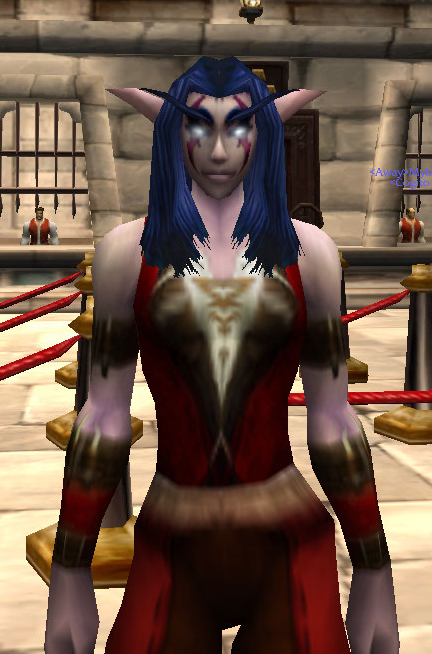 Her credentials include serving time with the Night Watch of Duskwood, helping to secure the Sunwell on the Isle of Quel’Danas, and holding the front with fellow soldiers in Northrend. 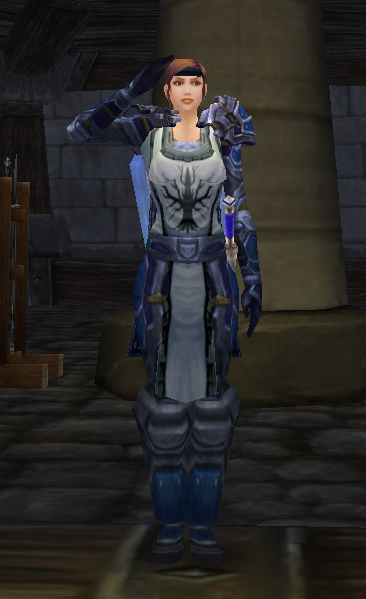 She has lobbied for aid for Darkshire in the Royal Court, overcome the tremendous burden of her infant child and husband being murdered by undead, and served the Alliance with pride. She is here to talk to you about a very grave concern to all female warriors everywhere. A threat more sinister than Kel’thuzad, more warped than Illidan, more depraved than the Lich King, and yes, even more nefarious than Deathwing. Yes, I am fully aware that this game is created in the fantasy genre, home of damsels in distress and heroines in metal thongs. I have not forgotten that this game is designed, for the most part, by (and for) men. While a lot of this game is suspension of disbelief (as my husband would say, “We’re burying an elf”), I have a difficult time wrapping my head around my warrior tanking Arthas in a titanium swimsuit. That being said, I have made it my mission to create outfits for her that are the exact opposite of revealing: full plate armor that covers as much skin as possible, providing a barrier between weak human flesh and a dragon’s cleave. So I present Etana Newbury, proud (and fully-clothed!) warrior of the Alliance. It may look strange to have another post about Celarus… but this is a completely different Celarus, I assure you. Celarus was a minor character in a Human Tanwen (also referred to as Bizarro Tanwen) storyline when the dear priestess was in the process of being corrupted by Fierine. Celarus Brightamber, sister of Tanwen Brightamber, was a skilled swordswoman who volunteered to join the assault on and containment of the undead in the Plaguelands. She wrote letters home religiously at first but when the letters abruptly ceased to arrive, the Brightamber family feared the worst. Though no official confirmation was ever received, Celarus was presumed dead. The loss of her sister directly shaped Tanwen’s life from that point forward. When Tanwen’s life grew increasingly complicated, an intimidating figure calling herself “The Messenger” appeared to both friend and foe alike. She commanded (upon threat of death) that Tanwen be protected at all costs, then disappeared. The story the family doesn’t know, of course, is the grisly death of their beloved eldest daughter at the hands of a cruel necromancer and his minions. She fought tooth and nail and was, in fact, the last of her company standing when she was slain. As a final insult, the necromancer raised her in undeath and set her on the Lich King’s path. When Mograine claimed Acherus, she used her new-found skills to track down her sister and watch from a safe distance until things became a little too intense. Tanwen has still never seen Celarus in the flesh, as it were, despite her vivid dreams involving her sister appearing to relay important messages. But before her deletion, I thought it necessary to document her closet of both battlegarb and casualwear. 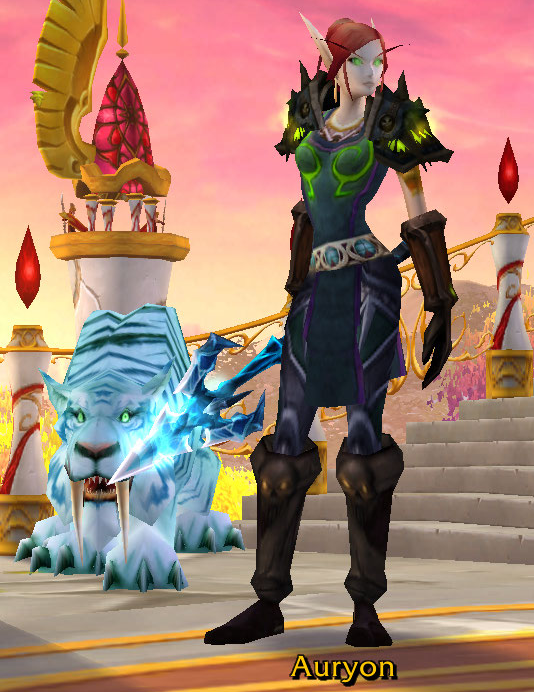 While nothing particularly breathtaking (she’s just a level 58 DK after all), I spent quite a bit of time putting together some of her gear and wanted to share her various outfits before she disappeared forever. Her FlagRSP entry and clothes after the jump! WARNING: This is a post full of fifteen million different items. I did not provide a link to them because a.) there are fifteen million and b.) WoWHead can conveniently provide you with all the links you need! I have tried. In fact, I was a mage for the first year and a half of my WoW career. Not a very good mage, mind you, but a mage. Then I dabbled as a hunter. And then I rolled Tanwen. After that, it was all over. Priest after priest after priest. Two Sin’dorei at 80, one human (then Sin’dorei, soon back to human) at 80, one draenei in mid-50s, and various other races scattered across servers. I’ve tried leveling other characters. In fact, I have my hunter at 80 and my shaman at 80. My mage, my DK, and my druid are all wallowing in the mid-70’s, all but forgotten. But Tanwen… Tanwen is my favorite, by far. But what if she were other classes? She would be very stylish. In several cases, things have been chosen strictly for color scheme or matching purposes. I’ve also included cloth interpretations that I could actually acquire for Tanwen should she need to dress up as some other class. Most of the cloth outfits are more “around town and casual” than battle armor, as finding cloth to mimic mail and plate eludes me.